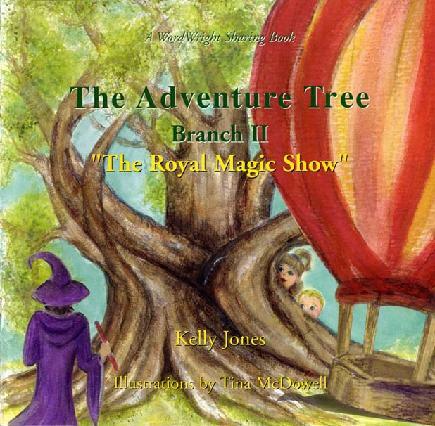 Please enjoy an excerpt from The Adventure Tree, The Adventure Tree - Branch II: "The Royal Magic Show" and The Adventure Tree - Branch III: "A Crystal Clear Christmas". ..."As they walked along the thick, brown branch of the tree, it amazed them that it really did seem to go on forever. "Willow, wait up. My shoe came untied." Frustrated, he sighed. "Can you help me?" "Of course. Stand still and I'll tie it for you, but hold on to that branch of leaves." Willow turned to help her brother with his untied shoe. "There," she said. As she turned around, she heard a rustling in the branches. "Sshh," she whispered. "Don't say anything. walk quietly toward the end of the branch so we can take a closer look." Just as they began to tiptoe closer, they both let out a scream. "Aaahhh!" From the end of the branch, a monkey jumped out. He took one look at Zak and Willow and let out a scream of his own. "Aaahhh." Zak barely got words out of his mouth, he was so startled. "Where did you come from? Who-who are you? W-h-a-t do you want Mister monkey?" "Young boy, what do you mean where did I come from? Where did you come from? And by the way , my name is not Mister monkey, it's Jonas and I live on this island." ..."Look at this branch!" Willow pointed to a particularly large one over to the right. "Let's walk on it. It's covered with clouds so who knows where it will lead." Willow began to run and Zak followed closely. They ran and ran until Willow got ahead of zak until he could no longer see her. "Willow, where are you?" Zak ran faster and the clouds made it difficult to see anything. "Willow! I can't see you." Willow stopped and realized that Zak wasn't behind her. 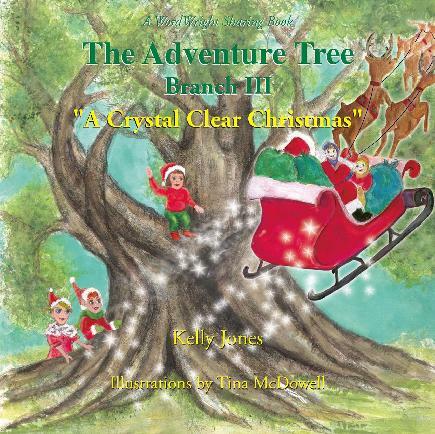 As she turned to look for him, he crashed right into her, knocking them off the branch. The clouds were so thick they could't see where they were falling. As the children waved their arms and yelled for help, they stopped as they realized they were now flying upward. They held on tight to each other and as the clouds slowly moved away, they realized they were floating. Zak screamed. "Wow!" "We're in a hot air balloon!" Willow opened her eyes. "Oh my goodness, we are!" They could hardly believe that they were indeed floating in a big, beautiful balloon. As they jumped for joy, two birds flew by and chirped happily, "Hello children." The kids sang right back, "Hello birdies, goodbye birdies." They began to float down towards a beautiful village with cobblestone streets filled with shopkeepers sweeping the fronts of their stores and a group of jugglers next to a glistening fountain in the middle of town. A little further away, they spotted a magician entertaining a group of townspeople. Willow looked with wide, excited eyes at the magician who was taking a bow. The townspeople were clapping, smiling and shaking their heads in amazement at the talented man. The children drifted a little further where they spotted an enormous, white castle. All of a sudden they felt a sharp movement of the balloon. They flew through the air and landed not on a treebranch but in a fast moving sled. They immediately felt a rush of cold, crisp air against their faces, which turned their cheeks a bright shade of red. They grabbed the siderails as they sped gracefully over the fresh fallen snow. "Hold on Zak, we're moving quickly." "Look at all this snow. Where are Willow?" Zak found that he had to almost yell for Willow to hear him over the air rushing around them. Willow turned toward her brother. "I don't know. It seems like we're starting to slow down though." The cold air made them shiver, and when they glanced down, they noticed the brightly colored, thick , warm coats they both wore. A short time later, they noticed a small row of snow-covered homes, which led to a large, brightly lit building. The now barely moving sled suddenly came to a halt at the lamppost in the middle of the town. "Yeah Zak. Look around, what a town!" When they looked down the street, they saw a small girl coming toward them. She reminded Willow of an elf. She wore red and and green clothes with pointy shoes that seemed to match her pointy ears. She also had a welcoming, friendly smile that twinkled against the light. "Hello there" she said. "I'm Pixie, I've been expecting you." Looking quickly at each other, the children gasped. "What did you say? How did you know we were coming?" "I dreamed about you." As if Pixie knew all of the questions going through the children's minds, she quickly added, "I'm one of santa's elves. We can do special things." Before she could finish, Zak jumped in. "Santa's elves! Are we at the North Pole?" Pixie answered sweetly, "Yes, look up!"